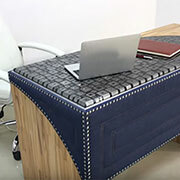 This unique denim-wrapped Beech desk with poured resin top by Positive Couple is designed to show you that you can experiment with your own creative ideas. Creating an elegant home office shouldn't have to cost a fortune when there are plenty of affordable solutions to dress up the space. 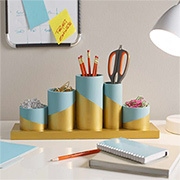 Use old baking tins and lids, some Rust-Oleum spray paint and a roll of cork to give your home office a revamp. If you're looking to set up a home office, we have put together a selection of 10 home office desks you can make. If you work from home and are in the process of setting up your own home office, we've got a three helpful designer tips for you. 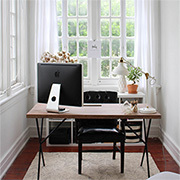 It's not always easy to find a suitable space to set up a home office, and that's why Jenny-Lee and her partner, Sean, turned an unused stoep into a functional home office. As more people work from home, you need to find the space to set up a small home office. If your home office needs an update, we've put together a collection of DIY project ideas to add something new to your home office. 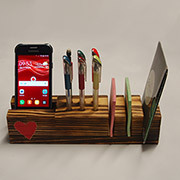 Use pine offcuts and leftover scraps to make a desk organiser that you can keep for yourself, or give as a Valentine's day gift. Progressive Workplace Design encompasses a variety of innovations which have been introduced since the beginning of the 21st century. Their purpose is to optimize employee experience and, as a result, performance. 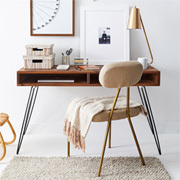 If you need a stylish desk for your home office, follow the instructions to make this super-easy plywood desk with hairpin legs. 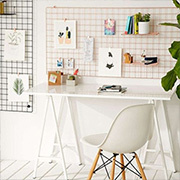 Give your home office a much-needed facelift with these easy decorating tips. Take a look at how easy it is to set up your own home office with laminated pine shelving or pine plywood that you can buy at Builders. 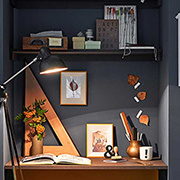 Here's a super-easy way to create an area for a home office without too much fuss. It's so easy to turn an underused spare room into a multi-function space for use as a home office and spare bedroom. I am in the process of trying to decide what to do with my home office. 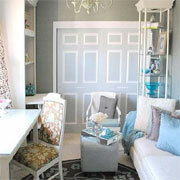 As I look for ideas, I'm sharing some beautiful home office inspiration. Wi-Fi makes it possible to set up a craft or work space anywhere in a home, but if you run your own business, or do freelance work, setting aside a dedicated space makes the job far more pleasant. When your home also doubles up as your office, it’s not easy to create a work / life balance. 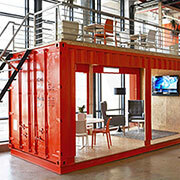 In this case you need to design a solution that does double duty - as a functional office and a cosy living space. A modern desk on the cheap! 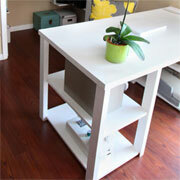 If you are setting up a home office, or space to work at home, you're going to need a desk. This modern desk is made using a couple of secondhand filing cabinets, a glass top, and an inexpensive hollow core door. At a recent workshop I showed how to make a simple pinboard but wanted to make this a bit more practical for my own home office. 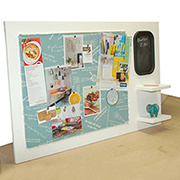 This basic pinboard is mounted into a frame and offers more organisation. From overstuffed cabinets to piles of paperwork, if your office is looking more like a war zone and less like a creative and productive space, here are some solutions to finding peace and calm in your office once again. Home-Dzine is all about inspiring design, but it's also about furniture that can be easy to make on your own. Here is a knockoff designer desk that you can DIY. 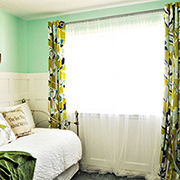 All it takes is some time and a bit of creative imagination to turn a dated guest bedroom / home office into a modern dual purpose space that is refreshing and colourful. Here is a desk that you can make that has storage shelves on the sides, and a storage cubby in the top for books or files - to keep the desktop clutter free and neat. 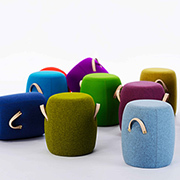 Aptly named as 'Bonbons' this new seating from Ergoform has the same appeal as an array of assorted candies on a tray. And with such a wide variety of colours, the only problem is which one to choose? It's a new year and the opportunity for a new start. 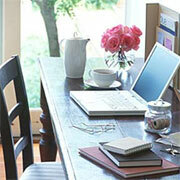 Plan and decorate a home office that is comfortable and practical and allows you to work from home. 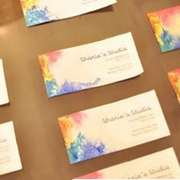 We put together a collection of ideas and inspiration to get those creative juices flowing. 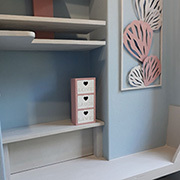 Building a couple of side-by-side bookcases using MDF provides ample storage for files and storage baskets, and even space to include a few decorative accessories to add a personal touch to the space. 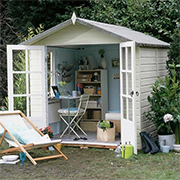 If you are in desperate need of a home office but simply do not have anywhere to set up indoors, you could consider turning a garden shed or wendy into a home office in the garden. Whether it's a place to sit when you do your monthly accounts or a small home office, you want to set up a spot that you can claim as yours. 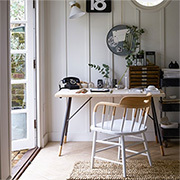 We put together a selection of ideas for a practical home office space that looks good. Acquiring a few basic DIY skills can empower you in so many ways. 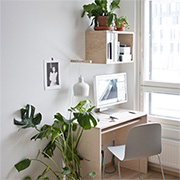 Just being able to cut your own pieces of wood or board and you can DIY furniture to create your own studio or office using secondhand or salvaged cabinets. 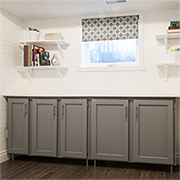 We recently showed you how to make a craft or hobby centre on storage cubbies or shelves. In this project you can take the design one step further by adding a storage shelf and glass top to the storage shelves. 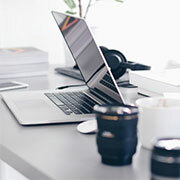 The trend in working from home is growing, as more entrepreneurs set up a home office and savvy employers realise the benefits of letting valuable employees base themselves at home. 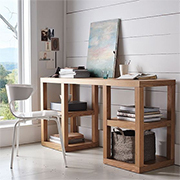 Furniture for a home office, particularly desks, has evolved from being purely functional - to furniture that can be used to set up a home office anywhere in a home. 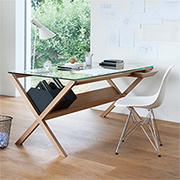 It's stylish, modern and yet still practical as a work space. 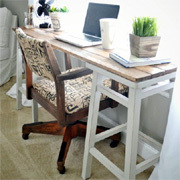 This desk made using bar stools and PAR pine is a really affordable way to knock up a practical desk for a home office. 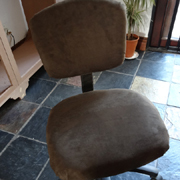 This weekend I decided the time had come to reupholster my chair. The foam has gone so flat, it's like sitting on a block of hard wood. 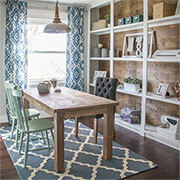 If you are setting up a home office, this article deals with DIY furniture options for your home office. 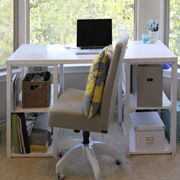 There are some amazingly simple and DIY options for a desk for your home office. Often it's difficult to remember a time when it wasn't possible to dispatch the printed word across the world instantly, access information on any subject, order goods and services at the touch of a button, and communicate with people and organisations around the world. If you have a home office or craft room, you will already know how important it is to have plenty of storage for keeping these rooms neat and organised. This handy storage caddy won't cost a lot to make and will provide you with plenty of storage without taking up too much space. Just like your home, a home office is a reflection of your individual personality and decorating in a style that you love will ultimately result in an office that you enjoy to work it. Not every home has space for a dedicated home office. But where space is limited it's time to put your creative thinking cap on to invent new ways to incorporate a working space. To create your own instant workspace anywhere, put a hollow-core door atop two adjustable trestles. Paint the door with Rust-Oleum spray gloss enamel, or cover with self-adhesive vinyl (both available at your local Builders Warehouse. I was totally over brown in my home office. Everything in there was brown, the walls, the furniture, the curtains. Blah blah blah brown. Working from home brings numerous benefits to one's lifestyle, and using feng shui as part of your decorating can help you make the best of it. Follow these basic feng shui guidelines to create a harmonious and successful feng shui office. 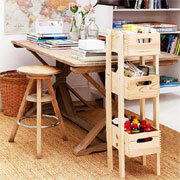 Is the only available work space in your house the dining table? Don’t despair . Here are some ideas that show you just how easy working from home can be - and it can be packed away in minutes! The only materials that you'll need for this build is a coat hanger, which is quite surprising. That's all. 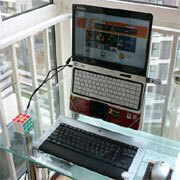 This build is made to work with an external keyboard and mouse, like most ergonomic laptop stands. You'll also need a corner of a desk to anchor your stand to. With more professionals packing up their laptops and heading for home, the Home Office needs to be a space that not only looks good, but works as well! 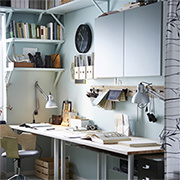 If your home office is overflowing with clutter, perhaps it's time to look at getting a bit more organised. 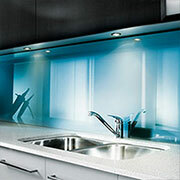 If your office is organised you will automatically become more efficient! 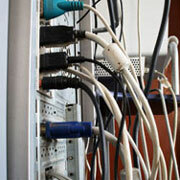 Making smart choices about everything from your desk lamp to your Internet access will make your office work for you. Creating your own home office is a great idea to make working as convenient and productive as possible.